Constructed from heavy-duty metal, TRAFFIC STRIPER(TM) produces 2-4 in. wide lines on asphalt, concrete, or turf. It rolls on 13 in. base created by four 6Â¾ in. rubber wheels, producing straight, even lines. Wind guard feature allows striping on windy days, minimizing over spray. Unit uses TRAFFIC STRIPE aerosol paint, emptying can with little or no waste, and can hold one case of paint. It is suited for use on parking lots, driveways, and sidewalks. 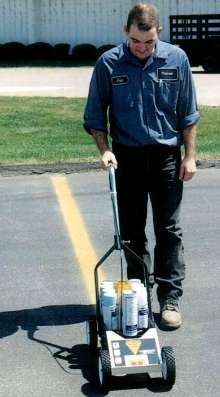 The TRAFFIC STRIPER(TM) makes striping parking lots, driveways and sidewalks easy. TRAFFIC STRIPER produces crisp lines from 2" to 4" wide on asphalt, concrete, or turf. For a straight and even line, the striper rolls smoothly on a stable 13" base created by four 6-3/4" rubber wheels. Its unique wind guard feature allows stripping on windy days with little or no over spray. Just pop in a can of TRAFFIC STRIPE aerosol paint into the unit, squeeze the trigger and walk. TRAFFIC STRIPE's aerosol paint cans are specially designed to empty completely with little or no waste. Constructed from heavy-duty metal, the TRAFFIC STRIPER is designed for years of rugged use and can hold a case of aerosol paint for added convenience. TRAFFIC STRIPE aerosol paint is available in white, yellow, handicap blue, red, black, green, gray, medium blue and fluorescent orange. All of Revere's products are intended for commercial use and are not sold to consumers.